This has to be one of the most comprehensive and fascinating collections of WWII footage that’s available to the public. 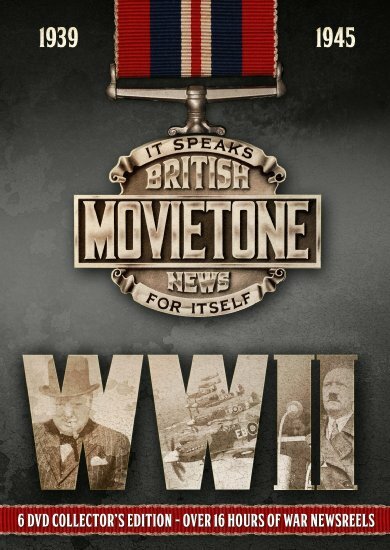 Movietone (founded in 1929) was the first sound newsreel service in Britain and, despite the scarcity of film, documented much of the war during both Allied highs and lows. There’s much to delve into in this thoroughly comprehensive collection, in fact we felt a little dwarfed just by the sample we were allocated to review. The films move through the entire war period, presenting the battles, political meetings and even humorous videos designed to keep morale high. You would be hard pressed to feel you didn’t get your money’s worth here. What’s consistently evident throughout is the attention to detail during the restoration work which has been done here. Visually many of the reels are clear, with sharp images and less damage than one would expect given their age. What’s even more impressive though is the sound quality; the narrator’s unfailingly upbeat voice come across strong and clear and the sound of gunfire and bombs is rattling. Whether you’re watching a thrilling firefight or experiencing British propaganda at its most forceful this is a surprisingly involving and interesting collection. There is so much material here, much of which hasn’t really seen the light of day since the war, that you can’t ask for a richer presentation of the British filmed war coverage. A definitive edition.